I adore discovering new and surprising information on perfectly ordinary subjects. Since the fabric of life is mostly woven with the routine and the mundane, learning something fresh on a regular basis is what keeps it interesting and exciting. I particularly enjoy facts that remind me that I am part of a much bigger, mysterious, absolutely astounding universe. No doubt you feel the same. Right? Nature provides an endless source of knowledge and anybody who spends time in it cannot fail to acquire some wisdom. There is gain in every encounter with nature. As part of my Mid-point review (scroll down to see the article from two weeks ago) and my ongoing quest to learn something new everyday, I came up with what I learned since the start of summer. Personal observations, further investigations/research and input from others has kept things around here quite interesting. 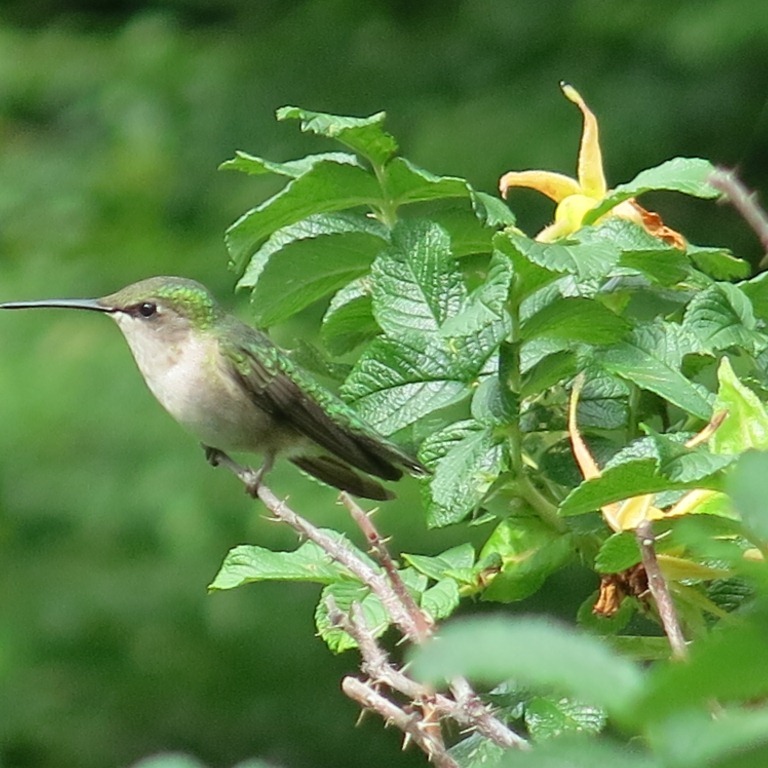 I observed that hummingbirds do not like to share. Unlike many birds that feed together at a feeder filled with seeds, these tiny avians prefer to dine solo. 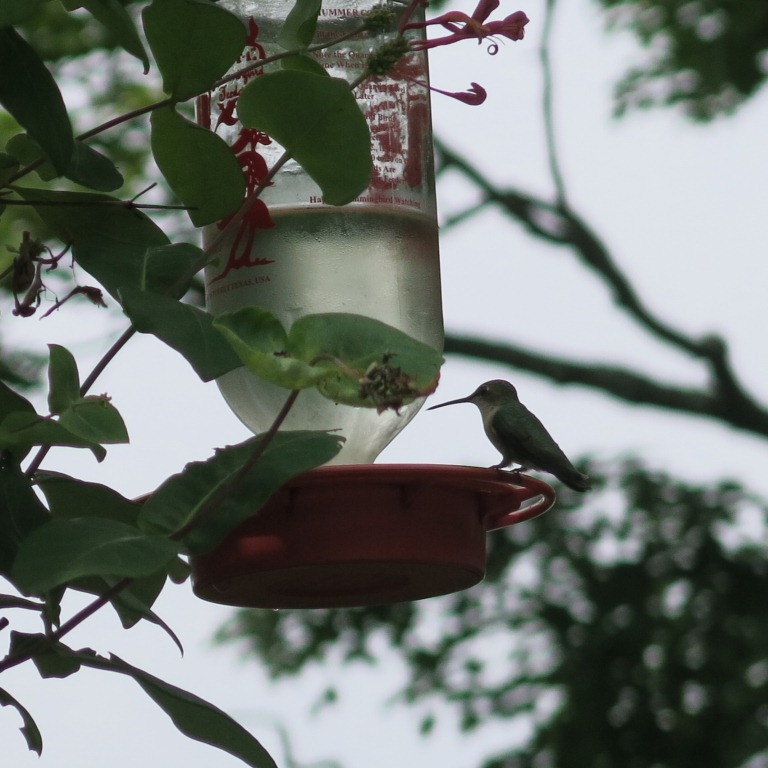 A feeder with sugar solution invites them to stop by quite effectively but just watch – while there is plenty of room and libation for all, the bird who is there first will aggressively try to shoo off any other bird also wanting a drink. They spend more time sparring than sipping. Spiders really do make their webs only in fair weather. IF they continue working during rain, it will be a short storm. You have a better way to predict the weather? I’ve always known the perfume of flowers is stronger as temperatures rise but now I’ve learned that the fragrance is stronger just before a storm when the air pressure is low. I’ll use that as a reminder to cut flowers to bring indoors before the storm smashes them down. There is a growing body of scientific evidence establishing a link between urban green spaces and a positive impact on human well-being. Unlike the short lived happiness of pay rises, promotions, purchases or that slice of cheesecake, the positive effect of time spent in nature is sustained for long periods. Reason to get outside and enjoy the green as much as possible. Its no wonder one can come in hot, weary and sore from working in the garden and still feel really invigorated. Amongst many types of birds, the way to a female’s heart is through her stomach. A male bird will ply his object of affection with juicy morsels of worms and bugs. Charming! 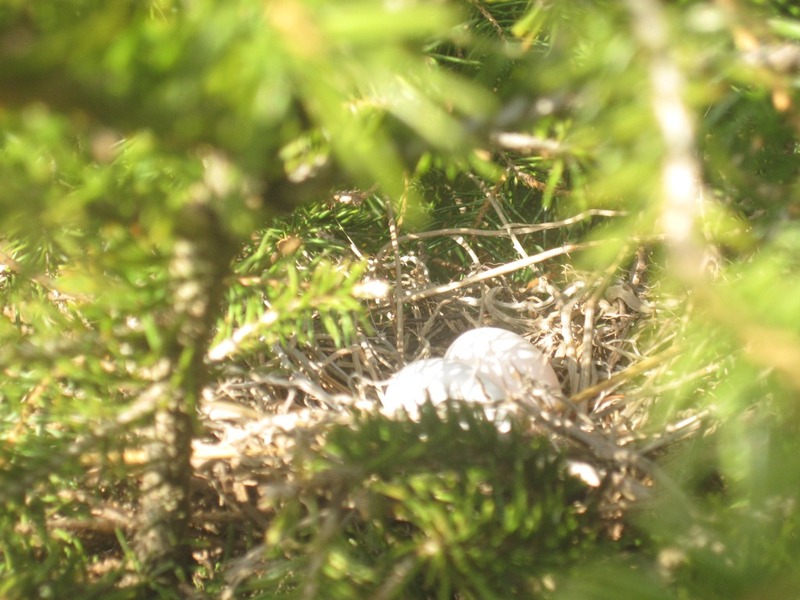 The eggshells of wild birds may act like “sunblock”, scientists in the UK have said. A range of birds’ eggs showed adaptations in pigment concentration and thickness to allow the right amount of sun to reach the embryos. No doubt this information will lead to useful applications amongst us sun loving humans. We are always wondering if there is life on other planets. But if there is, those life forms must be wondering the same right? If ‘people’ on a planet 65 million light years looked at Earth, they’d see dinosaurs not humans. Imagine that. For now, lets do right by our assigned planet. Because eventually, the time will come when the alien ‘people’ from all those 65 million light years of distance, will see us humans. And we’d better look our best. As a biologist, I’ve known this next fact but when I mentioned it to some others, they were surprised. So I thought I’d share. Fireflies are not flies. They are beetles. Chemical energy is converted to light energy in a ‘cold’ reaction. This is unusual. Most energy conversions use or generate heat. Thus, fireflies are the exceptions that prove the rule. Huge scientific contribution from a very little guy. Finally, something to ruminate over: Cows do not naturally eat corn – so why is ‘corn-fed’ beef touted to be superior? Being curious keeps one engaged and connected to the world around us. There is a comforting reassurance in that. We are all part of the grand web – the spiders as well as the flies. Understanding the seemingly ordinary opens the mind, enriches the spirit. We get a sense of who we are and our place in the large scheme. Q.E.D. 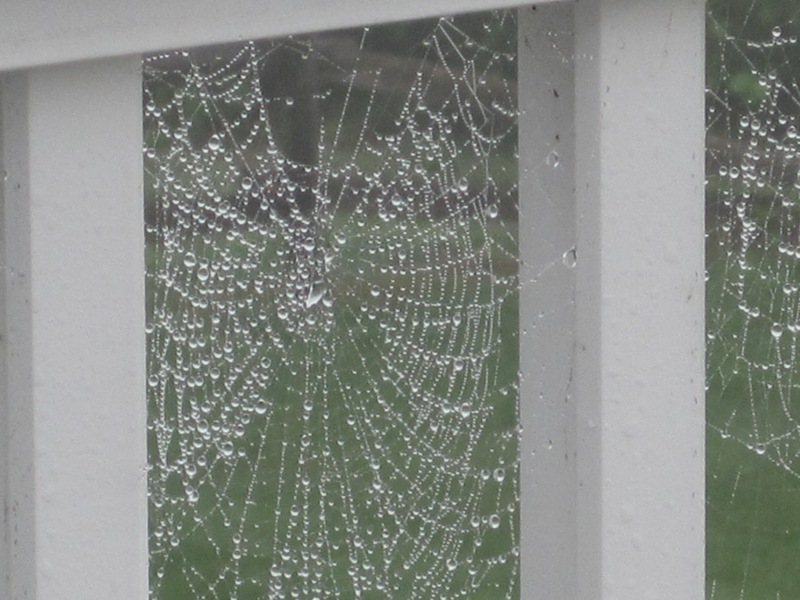 Empty spider web in the rain. This entry was posted in All Gods Creatures, Deep thoughts, The Garden Demystified, Your Garden and the Globe by shobha. Bookmark the permalink. Fireflies are beetles? Would love to see environmental strides made based in their ability to generate light (energy) without heat.